Showtime and Channel 4’s Homeland came to a close in the UK this past Sunday with a feature length double episode finale, and after weeks of building up the central stories of Carrie’s descent into a bipolar episode and Brody’s internal struggle between his outward portrayal of American hero and inner potential traitor, the show promised to go out with a bang in more ways than one. Having revealed Brody picking up a vest lined with dangerous explosives and having it prepped for a meeting with the vice president of the United States, it seemed that Carrie and Saul were rapidly running out of time to convince the rest of the CIA that a terrorist threat existed in the form of the perceived great Sergeant Brody. With this premise, the finale Marine One was representative of the twisting labyrinth that the show had become. I wrote in a review of the fourth episode Semper I (available here: https://rhettmedia.wordpress.com/2012/03/13/tv-review-catch-up-homeland/) that the show gave me the feeling that ‘some episodes may drag the overall quality of the show down in the sense that nothing much exciting or especially important will happen until the last few episodes’, but I’m pleased to stress that this feeling disappeared by the mid-point of the season. After the meandering first few episodes, the show really kicked into an intense higher gear around episode six and seven, and had become truly compulsive viewing to the point where the two-hour finale promised a magnificent television spectacle, the ambiguity of Brody’s intentions and Carrie’s infectious desperation to close the dangerous threat to national security making this one of the few genuinely can’t-miss episodic programmes to come down the pipeline in a number of years. Marine One itself was an expert piece of story-telling for the small screen, particularly considering the mastery of the pacing of the episode. With two-hours of television time to fill (obviously with adverts included), this was an example of a show that never really dragged or outstayed its welcome, being truly captivating throughout its duration. Admittedly, the first twenty to thirty minutes seemed slower than the show usually does, but this was for a definitive purpose. With the knowledge of something potentially grisly happening over the course of the episode, Marine One drew the audience through the spectrum of anxious patience, with a deliberate pace that conveyed the lingering threat of death in the air as Brody travelled to meet the vice president and numerous other high-ranking government officials. This eerie sense of foreboding jeopardy hung in the air, before shots rang out from the sniper rifle of another turned marine, Tom Walker. The timing of this scene is exceptional, in that it captures the suddenness of violence representative of terrorism in the 21st century; a macabre instant of human cruelty resulting in pure panic and fear. The scene is shockingly brutal, visceral and grimly reflective of the darker aspect of the troubling constitution of modern human nature and absolutely conveys the senseless swiftness of pre-meditated terrorist violence. 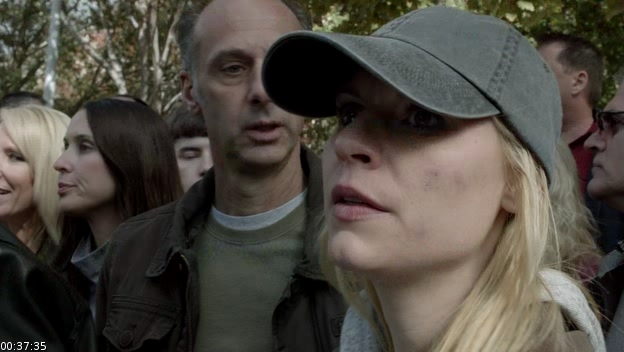 While this scene was a brilliant example of how good Homeland can be, what followed was surely one of the most sublime performances and well-written pieces of all television to grace the screen for quite some time. With a bevy of prestigious political figureheads being sequestered in a secure bunker amid the chaotic rifle fire that took place just instances ago, it seems that now will be the moment where Brody , Marine One, can finally execute the horrifying attack he has been sent to perpetrate. With his vest strapped tightly to his chest and his thumb straying towards the cap of the detonator, everything we have learnt about Brody and the weeks of build-up surrounding the ethics, the motivations and the morality of the potential attack has led to a magnificent crescendo in this scene. Switching between fast-paced shots between the unaware politicians and the conflicted but more importantly terrified Brody’s face, the scene is incredibly tense and utterly absorbing, and when Brody presses the trigger to no explosion, a confused collective sigh of relief escapes the room. The vest has malfunctioned, and upon excusing himself to the bathroom, he fixes the suit and is ready once more to desperately attempt to go through with the deed. This leads to the marine being talked out of the event by his teenage daughter and by the time Brody is ushered out of the room, it does not come across as a let-down that Brody failed in completing his objective whatsoever. 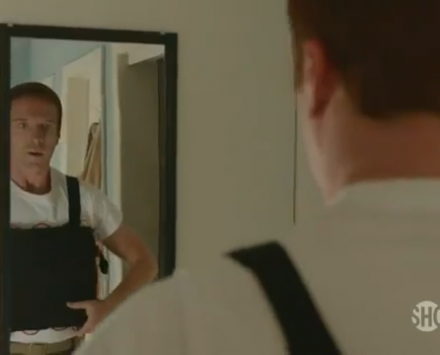 Damian Lewis’ performance here is what makes this truly mind-blowingly spectacular, and the intimate shots of the anxiety and genuine fear written on his face captures the grim internal view of suicide bombing with utter panache and total realism. 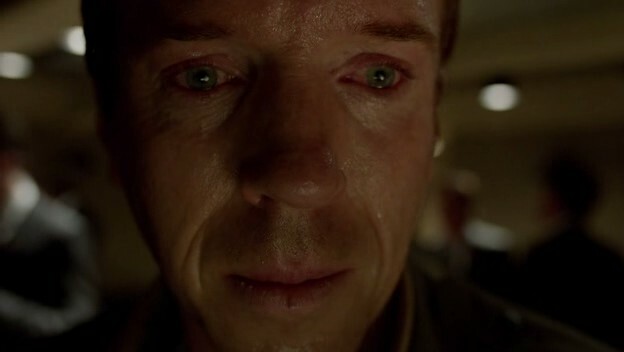 People have leant towards rightfully showering Claire Danes with praise for her performance throughout the show and won a Golden Globe for portraying Carrie, yet it seems almost criminal that Damian Lewis missed out for his performance here: a taut introspection into the mind of a suicide bomber and the conflict of giving one’s life for a particular cause here displayed in unabashed and disturbingly realistic clarity. Overall, Marine One built upon the growing legacy of Homeland as the finest new show on television within the last few years. It should be stated that there was a level of predictability to this finale, due to common sense ruling that Brody would not in fact blow himself to pieces and although it seems that the evolution into season two potentially offers Brody in the exact position he started season one at, it should be commended that the show didn’t have the marine realign himself completely to the United States, and his inevitable rejection of terrorist methodology is being treated with a more adept and astute slow burn over the course of next season. What all this means is that Marine One was an intensely riveting instalment that set things up magnificently for next season, and ascertains Homeland as one of those few shows that surpasses the incredible amount of hype lavished upon it, and I for one am waiting intently for the new series’ debut in the autumn. ~ by jrhett on May 10, 2012.